A booted Parking Division vehicle last weekend at the Transit Center gave Farmers Market attendees some food for thought. When the city of Durango boots its own vehicle, something’s afoot. There are a number of questions: Is this the “sole” occurrence of enabling disabling? Is booting the new civic uncivility? Does this act take the “pal” out of municipal? Time for Action Line to do some bootstrapping. We called up our good friend Wade Moore, the city’s parking operations manager. When it comes to parking-violation issues, Wade is just the ticket. It turns out that Jeep 304, the immobilized city vehicle, was parked for the weekend at the Transit Center. The booting was just a friendly Friday night prank. 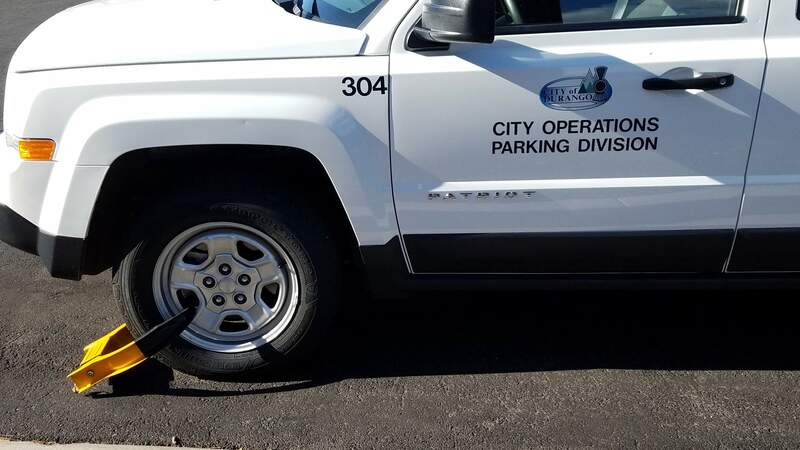 “It became quite the buzz at the Farmers Market and on Facebook,” said Wade, adding that more than a few organic oglers noted the irony of a Parking Division vehicle frozen by a wheel lock. How did the vehicle get the Yellow Clamp of Shame? It’s a long story. In Durango, parking enforcement officers will boot any heel having two unpaid citations over 30 days in arrears, Wade said. Once a vehicle gets booted, all fines and penalties must be paid along with a $50 boot fee. Scofflaws have three days to fork over the cash. After 72 hours, the vehicle will be towed, incurring more fees, fines and disgrace. Naturally, a boot earns the immediate attention of most transit transgressors, who settle the matter quickly if not expensively. But what if you discover the dreaded device in the evening or on a weekend? Wade said there are two options. You can either leave the hobbled ride until the next morning or until Monday, or you can ask nonemergency dispatch to summon the next available police officer to remove the curbside curse. If the police come after hours, you will receive a citation. This is to ensure you pay your fines and fees promptly. The fact that you got the boot in the first place indicates that you don’t pay your fines and fees promptly. In any case, the boot is removed. The ticketed scofflaw drives off. And the officer now has this heavy boot that needs to get back to the Parking Division. Thing is, the Transit Center is closed at nights and on weekends. The officer could put the boot in the boot (the British term for vehicle trunk) and return it later. But do we want our police officers dealing with a boot clattering around in the back of a squad car all night or all weekend over several shifts? So, in the Case of Booted Jeep 304, the officer returned the device on a Friday night (no doubt with a wink and a chuckle) by placing the boot on the very vehicle used for booting. “304 is indeed the Bootmobile,” Wade confirmed with a laugh. Wade was actually grateful the clamp was returned so quickly and securely. “If the police had just left the boot by the front door, it would have undoubtedly ended up in a dorm room to be displayed next to a stolen traffic sign,” Wade said with another laugh. Time has expired. So let’s just end by saying that when it comes to the top summer-ending hotfoot, booting, the Bootmobile is a shoo-in. Email questions to actionline@durangoherald.com or mail them to Action Line, The Durango Herald, 1275 Main Ave., Durango, CO 81301. You can request anonymity if your Labor Day Rally took place on a mountain bike.